I am this bespectacled, spiritually-inclined, narcissistic & hedonistic kinda guy. There's No Way But Up I am this bespectacled, spiritually-inclined, narcissistic & hedonistic kinda guy. (Top to bottom): H.H. the 7th Panchen Lama, Ucheyma (Severed Headed Vajrayogini), Vajra Varnani (green assistant), Vajra Vairocani (yellow assistant), Dorje Shugden and Citipati. I thought I share the article I wrote with the assistance of the other writers in my department. The result of this collaboration is this wonderful article that contains the comprehensive information on this fantastic tantric deity. It is hoped that people looking for resource on her will find it here and that it will connect people towards another wonderful form of Vajrayogini. I hope all who see this post would receive her initiation, do her practice intensely and achieve Kechara Paradise. 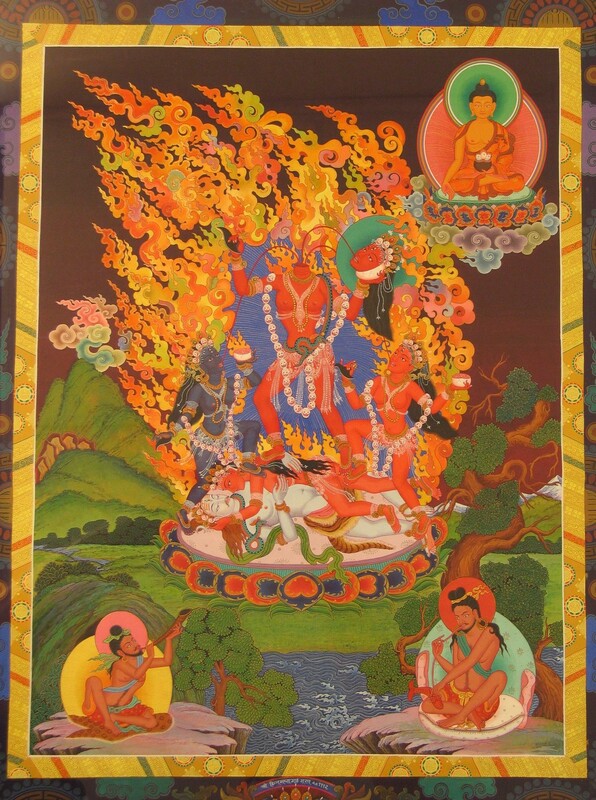 Ucheyma’s (Tibetan; Sanskrit: Chinnamasta) awe-inspiring depiction as a self-decapitating goddess has inspired generations of practitioners since the introduction of tantric practice in ancient India. Her practice had migrated north to Tibet, where she is known as Dorje Neljorma Ucheyma. 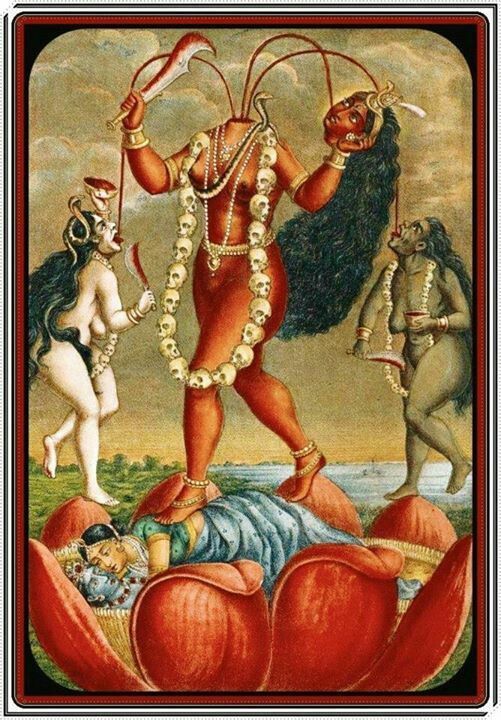 Both Ucheyma and Chinnamasta literally mean, “she whose head is severed.” Her practice has inspired a Hindu counterpart who is part of the ten Mahavidyas, avatars of Devi, the Mother Goddess. There are a number of temples dedicated to this goddess throughout India. in this degenerate age to subdue our various minds. then brings us to full liberation. May we never be separated from the Noble Headless Lady. The iconography of Buddhist deities, like their posture and the colour of their skin, is imbued with deep meaning. In fact, every deity represents an enlightened activity which primarily counters a particular delusion. For example, Green Tara sits in the Lalitasana posture with one leg folded on the lotus seat while her other leg is outstretched and hanging down, sometimes supported by a lotus flower. This is like someone who is sitting but has one leg positioned, always ready to arise in order to assist others. This denotes that her general activity is peaceful but her outstretched leg represents her readiness to assist and her swiftness in coming to the aid of her devotees. 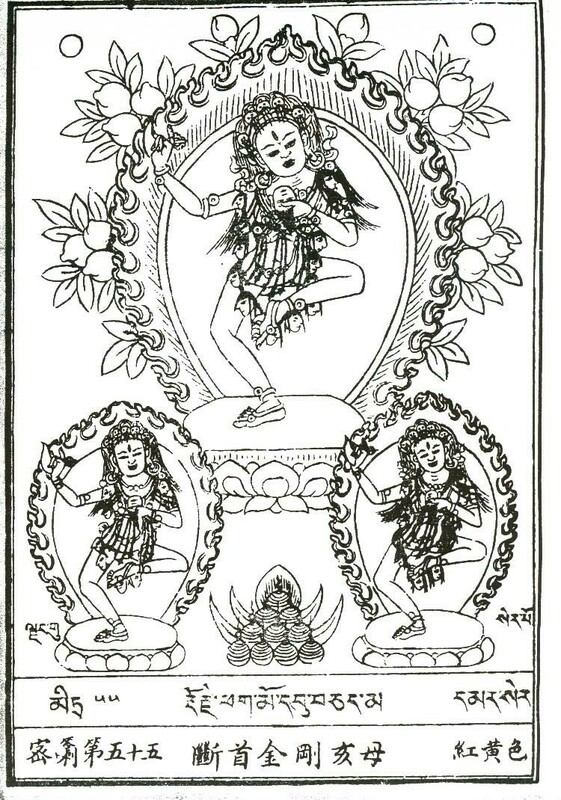 Vajrayogini Naro Kechari, on the other hand, is in the alidhasana posture, in the “attitude of drawing the bow,” with her left leg bent and the right leg straight. This means that she is poised and ready to do battle with our delusions and negative karma. The colour of the deity generally represents a particular delusion that the deity counters. For example, Green Tara’s green-hued skin means that her practice counters jealousy. Vajrayogini, with her bright coral-hued skin, shows that she counters desire. 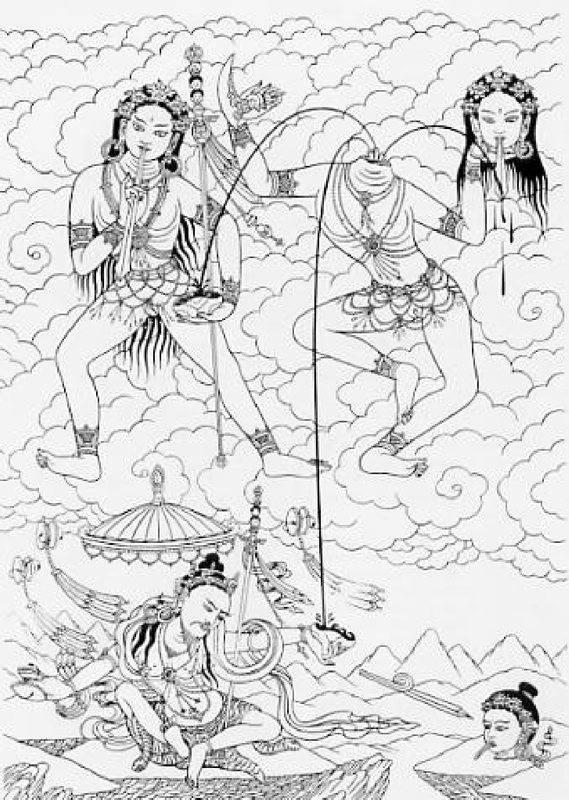 The practice of these deities usually targets one particular delusion as a means of eradicating all other delusions. Therefore, the eradication of that one delusion is like a doorway for the deity to gain access to the entire house, representing all other delusions. The Goddess Chinnamasta is in reality the Headless Vajrayogini or Ucheyma. 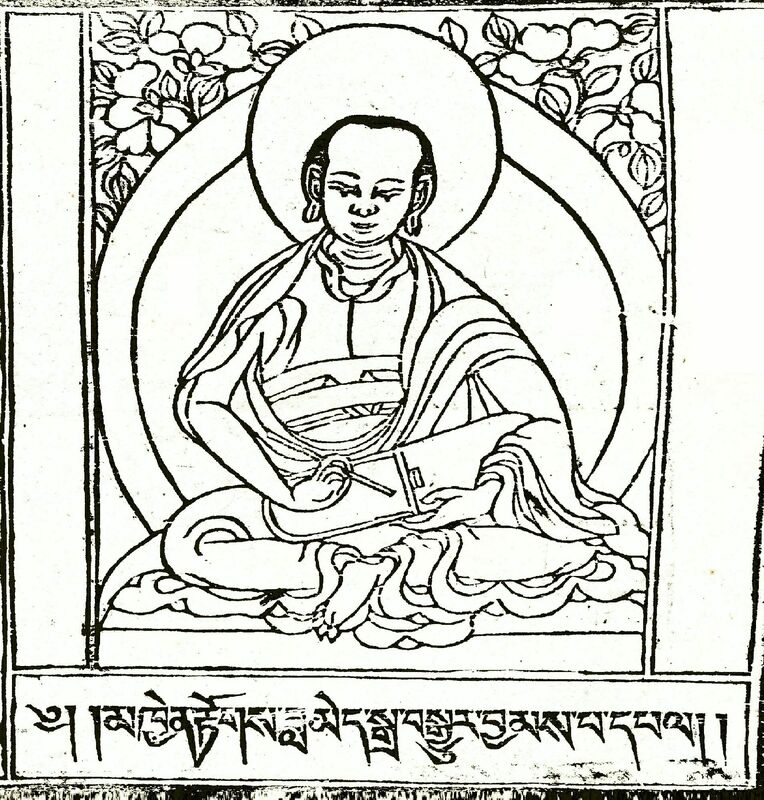 One of the most authoritative sources for the correct iconography of Ucheyma in the Buddhist tradition is found in the Rinchen Lhantab collection of sadhanas compiled by His Holiness the 7th Panchen Lama Tenpai Nyima (1782-1853). In page 238 of her sadhana, Ucheyma, referred to as Buddha Dakini, has orange-hued skin. Her right leg is straight, stepping on Kalarati while her left leg is bent, stepping on Bhairava. On the left of Ucheyma is her attendant Vajravarnani, who is green in colour. Her left leg is extended and she holds a ritual chopper in her right hand and a skullcup in her left. On Ucheyma’s right is Vajravairocani who is yellow in colour. Her right leg is extended and she holds the same implements as the other attendant. All three deity-figures are adorned with crowns of five dry skulls and wear a garland of fifty fresh heads around their necks. They are standing in the middle of a blazing wisdom fire. Ucheyma’s right hand, extended downwards, holds a curved ritual chopper and her left hand holds aloft a blood-filled skullcup. She holds a khatvanga (tantric ritual staff) on her left shoulder. Her head is severed and sits in the skullcup. The three severed blood vessels at the trunk of Ucheyma’s neck spurt three jets of blood that flow into the mouth of her own decapitated head that she carries in her left hand and the mouths of her two attendants. H.E. Tsem Rinpoche explained that the three represent the three root delusions and that the practice of Ucheyma purifies the psychic poisons of ignorance, hatred and desire. This purification leads to the attainment of the three bodies of a Buddha – the truth body, the enjoyment body and the emanation body. In other words, the severance of the ego via her tantric path leads to the purification of all delusions and ultimately, to the attainment of Buddhahood itself. Another depiction of Chinnamasta. Not only does her form depict her divine nature, but she also shows us that after we remove our egos, contrary to conventional thinking we do not die. Like her body can exist without her head, we can exist without our egos. The main symbolism of the headless Vajrayogini is not about non-attachment to the body as some might assume. It is about the clean and complete removal of the ego – the grasping at a self or individual identity. Generally, our self-identity is connected with our face more than any other part of our body. We usually recognise a person when we look at his or her face. Our ego is thus strongly associated with our face. Hence, Ucheyma uses her ritual knife to decapitate herself. This indicates that her practice eradicates the ego. The Severed Head Vajrayogini or Ucheyma, surrounded by the other forms of Vajrayogini. The Severed Head Vajrayogini removes all afflictive mental constructs by removing their root cause, the belief in a separate self or ego. We have feelings of attachment or aversion to people and circumstances because we have an ego to please, gratify and protect. However, in reality, this self or ‘I’ is illusory and does not really exist. Therefore, Ucheyma reveals this truth with the dramatic decapitation of her head. In this act, she also demonstrates that, without the ego, one is still able to live and function. Not only live, but live even better. Live a life of truth. Free from from false projections. She does this not through the divine powers of a Buddha but through direct perception of emptiness and egolessness. Contrary to what some people might think, the eradication of the self does not destroy individualism, our personality or turn us into mindless people. In fact, the eradication of the ego makes us more vibrant, compassionate and aware of the suffering of others. In other words, we become much warmer, kinder, forgiving, tolerant, conscientious, generous, and contemplative individuals. Basically, we are a joy to be with. Therefore, the cutting of the ego or the ‘I’ brings us closer to our true self, the Buddhanature within. The practice of Ucheyma is one of the important lineages of the tantric Buddha Vajrayogini. Vajrayogini’s cycle of teachings can be traced to the Chakrasamvara Root Tantra where she is described in Chapters 47 and 48. The Chakrasamvara Tantra in turn was taught by Buddha Shakyamuni who manifested in his mystical Tantric aspect of Buddha Vajradhara in order to teach the tantric system. Therefore Vajrayogini’s practice is classified as one of the Highest Yoga Tantras, which means that her practice can directly confer enlightenment within a single lifetime. H.H. 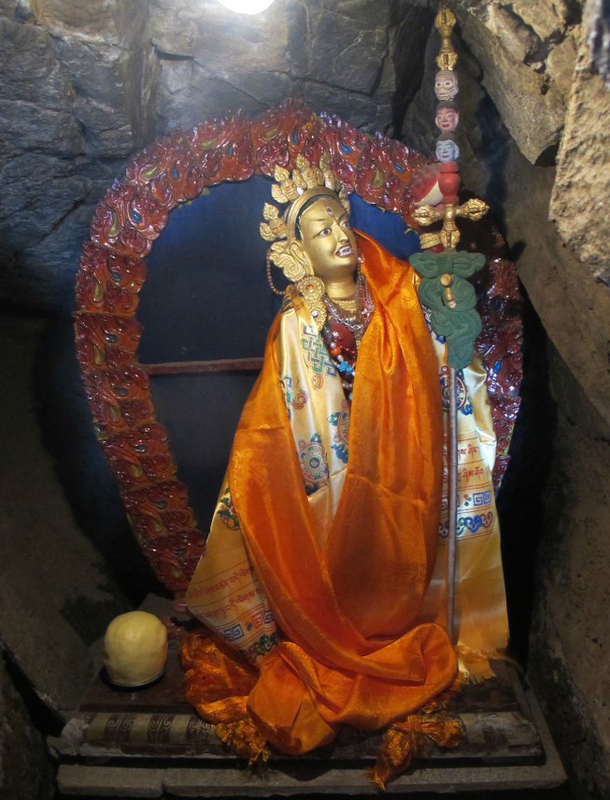 Kyabje Pabongka Rinpoche’s personal Vajrayogini statue inside his retreat cave. legs reflects the relative simplicity of her practice and yet, it has the most effective potential to bestow high attainments. According to the Chakrasamvara Tantra, Vajrayogini’s mantra is hailed as the ‘King of Mantras’ because it can bestow attainments merely by recitation alone. Her tantric system is therefore regarded as the most suitable for modern practitioners who have very little perseverance and time for the extended practice of other higher tantric systems. In addition, Vajrayogini is well-known to bring practitioners to her pure realm of Kechara Paradise if they engage in her practice sincerely. Ascension to her pure realm is desired because it is a special place emanated from her mind where all our needs are provided for and where there are no distractions to our practice, because everything in her realm is generated for practitioners to gain realisations. In other words, Kechara is the perfect place to take rebirth so we can continue our practice uninterruptedly on our path to Buddhahood. It is said that it will take the laziest of practitioners 14 lifetimes to ascend to the outer Kechara Paradise. Here, the outer Kechara Paradise refers to her physical pure realm. For those within Kyabje Pabongka Rinpoche’s special lineage of Vajrayogini in the form of Naro Kechari, the deity herself promised Pabongka Rinpoche that those who receive her initiation within four generations of Him will take only seven lifetimes to ascend to the outer Kechara Paradise. However, if we are a diligent practitioner we can achieve inner Kechara Paradise, also known as enlightenment, within this lifetime itself. 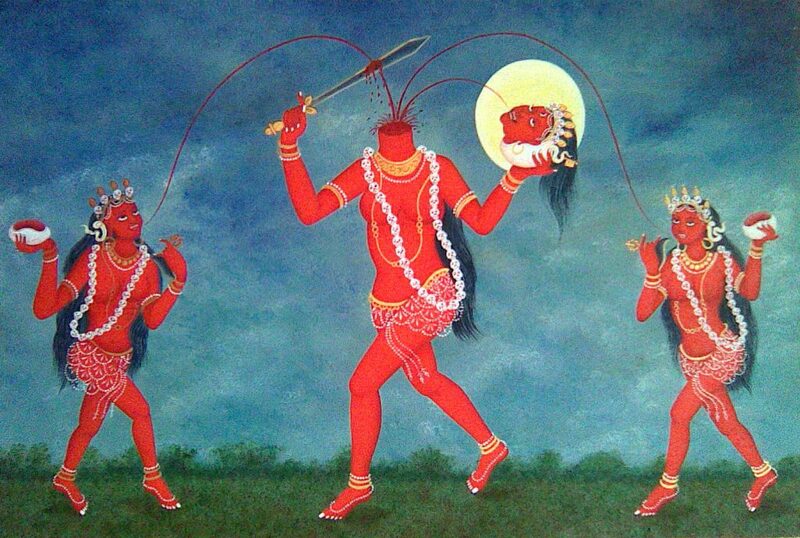 The Headless Vajrayogini is sometimes known as Trikaya Vajrayogini because her two attendants are her emanations. According to Taranatha’s Rinjung Gyatsacollection of practices and sadhanas, the lineage of this practice stems from the Mad Princess Mahasiddha Laksminkara. Her sadhana is also included in the Rinchen Lhantab by the 7th Panchen Lama, Tenpai Nyima. She is also included as one of the practices mentioned in the old biographies of Krsnacharya and the two sister mahasiddhas, Mekhala and Kanakhala. However, there are no current lineages that can be traced back to these mahasiddhas, which means that their lineage did not survive to this day. 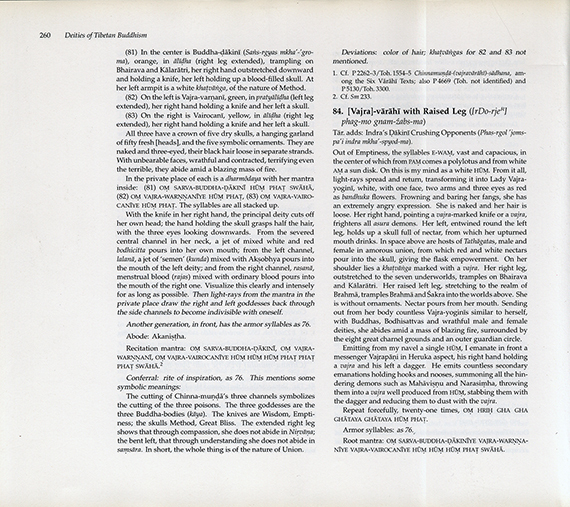 Pages 1175 to 1176 of the Rinjung Gyatsaby Taranatha includes a description of the Severed Head Goddess’s lineage. The lineage begins with Vajravarahi who transmitted it to Cham Laksminkara, and from the latter it was passed to Virupa the Younger, Avadhutipa, Dongdarpa, Sonyompa Gyalwa Jin, Sonyompa Sanggye Jin, Balpo Pandita Deva Akarachandra, Hungdu Karpo, Dragpa Varendraruchi, Chel Lo Kunga Dorje, Kyi Konchog Bar, Je Gyaltsa Rinpoche, Tropu Lotsawa, Lhachen Sowang, Tropu Sonam Sengge, Yangtsewa, Buton Rinchen Drub (also known as Buton Chenpo) and so forth. By understanding the lives of the lineage masters and how highly attained they were, we can see just how powerful Ucheyma’s practice must be, as well as the tremendous spiritual blessings she can bestow. For such great masters to have held her lineage and promoted her practice, they must have known the incredible potential that she can have in transforming our lives. Below are some brief descriptions about a few of the notable masters within the lineage. Cham Laksminkara. The main surviving lineage of Ucheyma in Tibet can be attributed to her. Also known as the “Mad Princess”, the Mahasiddha Laksminkara was initiated into the practice when Vajravarahi appeared to her in the form of Ucheyma. You can read more about Laksminkara below. Also known as the “Eastern Virupa”, he is not to be confused with the famous Mahasiddha Virupa from whom the lineage of Lamdre (the Path and its Fruit) teachings of the Sakya tradition is said to descend and who was posthumously recognised as an earlier incarnation of the Dharma Protector Dorje Shugden. 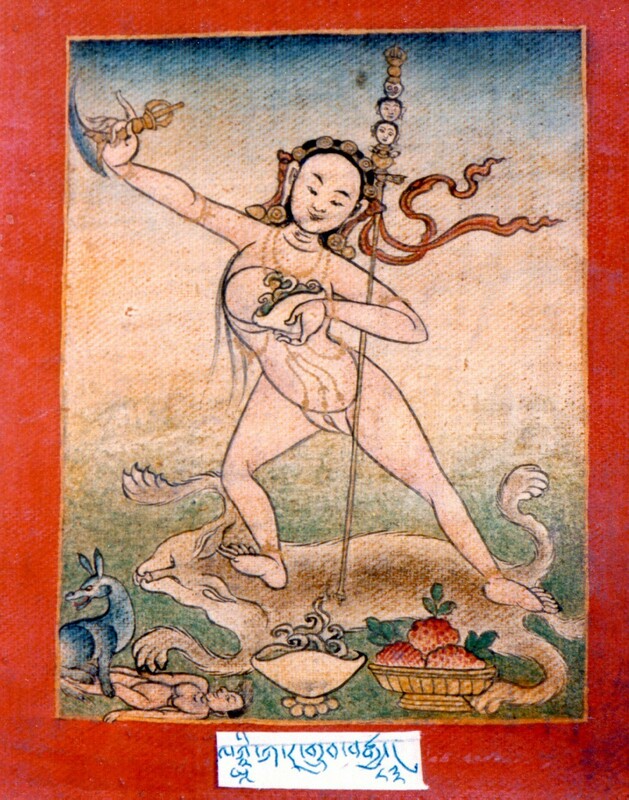 Virupa the Younger was in fact the teacher of the famed yogini Sukhasiddhi, whose teachings became incorporated to form the core of the Shangpa Kagyu tradition. Virupa the Younger is also famous for having been a primary lineage holder of various Vajravarahi practices and in particular, the Severed Head Goddess or Ucheyma. According to the master Taranatha, in his Book of Seven Mystic Revelations, Virupa the Younger later became the disciple of the older Virupa. Avadhutipa, a Mahasiddha who was known to be tremendously kind to children. The Mahasiddha Avadhutipa was an Indian king who came to follow the teachings of the Mahasiddha Damarupa. Eventually, he renounced his kingdom in order to practise a path free from extremes. He was a Mahasiddha who was tremendously kind to children, and was known to spend his time playing in the streets with them. He also transmitted the Lamdre teachings to the Indian Pandit Gayadhara, who is famed for later transmitting them in Tibet. Dongdarpa was from the Indian kingdom of Magadha and at an early age gained a strong desire to enter religious life. Having heard that Avadhutipa was residing in Bengal and had attained enlightenment, he disguised himself as a monk and went to meet the master. Following Avadhutipa for three years, he was initiated into the practice of Vajravarahi and had a clear vision of her. After leaving Avadhutipa and while residing at Jalandhara, he heard about a tirthika who was to engage in a contest with the monks of Vikramasila Monastery in both philosophy and supernatural powers. The monks had difficulties in finding a scholar who could defeat the tirthika, and so, learning of this, Dongdarpa travelled to the debate and volunteered himself just as it was about to begin. Deciding to challenge Dongdarpa with supernatural powers, the tirthikaemanated a poisonous, shimmering snake to destroy him. Having attained mastery of the Vajravarahi practice, Dongdarpa transformed his head to resemble the sow head commonly depicted atop Vajravarahi’s head. Making the sound “thik”, he swallowed the snake in one single gulp. Thus he defeated the tirthika, who then converted to Buddhism according to the tradition of the time, when those defeated in debate or contests of supernatural powers would convert to the tradition of the victor. 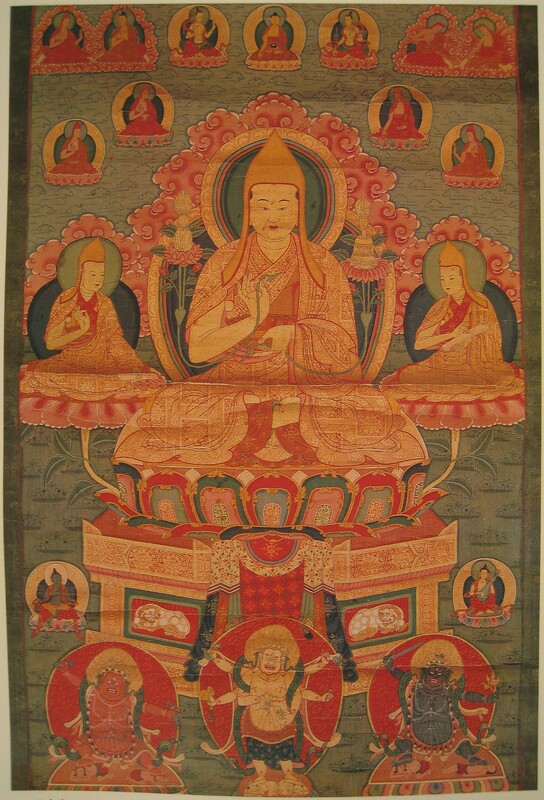 Dongdarpa is not only known for his propagation of the main Vajravarahi practice but also the Ucheyma practice as well. Sonyompa Gyalwa Jin was once a great king who, after raising his son Bhojadeva to take his place on the throne, proceeded to the forest, accompanied by his retinue, to become a renunciate. There he chanced upon Dongdarpa, who stared at the king for a prolonged time. Angered at Dongdarpa’s insolence at staring for so long, the king ordered his retinue to kill the yogin. Dongdarpa however, pronounced several discourses on the Dharma and the king was subdued and took up meditative practice. He became known as Sonyompa or “alms-gatherer” and attained supernatural abilities through his practice. Sonyompa Sangye Jin was Sonyompa Gyalwa Jin’s attendant. Together they travelled to Nepal where they begged for alms at the door of a man named Mahe Bharo, who sent his servant to give them food and wine. When she poured wine into Sonyompa Sangye Jin’s skull-cup, she was astonished to see it boil. She hurried back to report to Mahe Bharo, who developed great faith in the masters and went out to give them both alms himself. 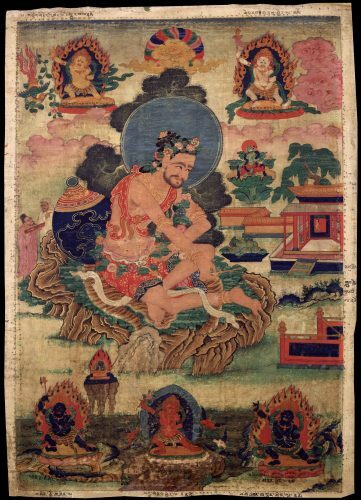 Balpo Pandita Deva Akarachandra was the son of a Nepali monk and is regarded as a reincarnation of King Arshadhara who was the father of Mandarava, one of the two principal consorts of Guru Rinpoche. Also known as Sunyatasamadhi, Balpo Pandita Deva Akarachandra was one of the pupils of Maitripa together with the likes of Dipamkara Srijnana Atisha and the famed translator Marpa. According to the Blue Annals, a historical survey of Buddhism in Tibet, Hungdu Karpo’s given name was Punyakarabhadra and his formal name was Varendraruci. He was a Newari who, amongst other things, had aided Ngok Lotsawa Loden Sherab in translating five texts. Loden Sherab himself was known as a prolific translator and the master who brought the practice of the Dharma Protector Setrap from Bodhgaya in India to Tibet. Hungdu Karpo was an expert in the Vajravarahi cycles of teachings, including the Ucheyma practice. The translator Chel Lo Kunga Dorje was the son of Ngok Jo Tsultrim Sherab and his wife Dardze. Sadly, his father died when he was only seven months old. It is said that at the age of six, he was able to recite the Manjushri Namasamgiti text from memory. Later in life, although he wanted to become a monk, being an only son, he was expected to continue the family line. At the age of 25, he married and had three children. However, his aims of a spiritually-fulfilled life came to fruition when he founded a monastic educational institution at Zhung Treuzhing which became a primary centre for tantric teachings for many subsequent generations of the Kagyu tradition. Together with his brother Kunden (1148-1217), Je Gyaltsa Rinpoche founded the Tropu Kagyu lineage, one of the eight minor Kagyu lineages. He also founded Tropu Monastery which became the seat of the tradition. Although asked to marry, he slowly gained his father’s permission to remain single. He had 82 teachers who were mainly from the Kagyu lineages; prominent lamas from the Nyingma tradition; two who were the direct disciples of Padampa Sangye in the Zhije lineage; as well as teachers of Chöd, a practice closely associated with the Vajravarahi cycles of practice. Tropu Lotsawa, who invited the Kashmiri pandit and last Abbot of Nalanda Monastery in India, the great Shakyashri Bhadra, to Tibet. Tropu Lotsawa was an early progenitor of the Tropu Kagyu lineage and nephew of Je Gyaltsa Rinpoche. He became the abbot of Tropu Monastery and was a prolific translator of Buddhist scriptures, holder of lineages, host to important Indian Buddhist teachers and the creator of religious monuments. Once, after travelling to Nepal, he requested the Indian tantric master Mitrayogin to travel with him to Tibet. Mitrayogin’s teachings would go on to have a great impact on Tibetan Buddhism. He also invited the Kashmiri pandit and last Abbot of Nalanda Monastery in India, the great Shakyashri Bhadra, to Tibet. During Shakyashri Bhadra’s decade-long stay in Tibet, Tropu Lotsawa translated for this great master, earning him the impressive title of “Lotsawa,” an honorific term used to refer to a respected translator. Buton Rinchen Drub enacted countless incredible deeds, including the compilation and organisation of the Kangyur (spoken words of the Buddha) and Tangyur (commentaries of the teachings). By far the most famous of the later followers of the Tropu Kagyu tradition and the lineage holders of the Ucheyma practice was Buton Rinchen Drub. Originally a resident of Tropu Monastery, he later moved to Zhalu Monastery where he became the institution’s 11th Abbot. Buton Rinchen Drub is remembered to this day as a prodigious scholar, author and Tibet’s most celebrated historian. He is credited with having compiled and organised the Kangyur collection that contains the Indian scriptures based on the spoken words of the Buddha, and the Tangyur collection that contains the Indian and Tibetan commentaries of these teachings. Within his biography, Buton Rinchen Drub is also known by the epithet “Thamche Khyenpa” which literally means ‘the Omniscient One’. This refers to his reputation for very clear clairvoyance arising from his tantric practice. His biography is littered with various examples of his clairvoyance which became the basis of this epithet. Though Buton Rinchen Drub is commonly known for his practice of the Kalachakra Tantra, he was one of the key lineage holders of the Ucheyma practice as well. Due to the amazing feat they performed for their guru, the sister-mahasiddhas Mekhala and Kanakhala are known as the Headless Yoginis. Their story begins as the two unmarried daughters of an elderly widower in the ancient town of Devikotta in India. From a young age they developed a notorious reputation in the town for their schismatic ways and the nasty tricks they played on the townsfolk. According to his biography, the Mahasiddha Krsnacarya proliferated the practice of the headless Vajrayogini. The years rolled by and their father was finally able to marry them off into the families of fishermen in a faraway seaside village. These families did not know any better as news of the sisters’ exploits had not reached their ears. However, it did not take long for these families to realise that their acceptance of the sisters as brides was a big mistake. The sisters continued their nasty behaviour in their new homes especially with their husbands, who would tell the sisters off ceaselessly but to no avail. Even their neighbours began to hate them and had the most vicious things to say about them. At exactly that moment, the guru Krsnacarya arrived in town with a large retinue, amid a flurry of activity, great fanfare and the miraculous sound of damaru drums. On the spur of the moment, the sisters ran out and prostrated at his lotus feet, begging for teachings and instructions. The great master initiated them and instructed them in the practice of Vajravarahi which unites both wisdom and compassion, the two wings of enlightenment. This line drawing depicts the dramatic moment when the Mahasiddhas Mekhala and Kanakhala decapitated themselves as an offering to their Guru, the Mahasiddha Krsnacarya. Taking the instructions to heart, the two sisters meditated diligently for 12 years and achieved a high level of spiritual attainments. Later, they decided to pay a visit to their guru in order to request for more teachings. After searching for a while, they found him. Humbly, they prostrated themselves and walked reverently around him in the manner of paying their respects according to ancient Indian custom. Krsnacarya received them warmly but it was quite obvious that he could not recall who they were. The sisters told him the story of their original meeting and that he had initiated them into the practice of Vajravarahi. Look at these two great yogini-sisters! They have arrived at their destination with joy. And set out to bring this joy to others instead. Thereafter, Krsnacarya restored their heads back onto their bodies perfectly, without even the slightest scar on their necks. In humility and gratitude for the Dharma they had received, the sisters once again prostrated before their guru and touched his feet in reverence. It is said that at that very moment of gratitude, the sisters purified the last vestiges of negativity and attained the siddhi of Mahamudra or enlightenment. From then on, the sisters were known as the Headless Yoginis and it was due to this incident that they were associated with Ucheyma. Perhaps the sisters had also received the practice of Ucheyma from their guru, although this is not mentioned in their biography. However, in the biography of Krsnacarya it is mentioned that he gave the Ucheyma initiation and teachings seven days before he passed away and entered the Paradise of the Dakinis. As for the sisters, they worked tirelessly for many years in order to benefit sentient beings and when their time came, they rose up to enter the Paradise of the Dakinis in their own bodies. Ucheyma – the awe-inspiring image of ‘She Whose Head is Severed’. It is said that within the Dakini realm of Oddiyana, King Indrabhuti was the ruler of the kingdom of Sambhola while King Jalendra ruled the neighbouring kingdom of Lankapuri. In order to secure an alliance between both kingdoms, Indrabhuti betrothed his sister, Laksminkara to Jalendra’s son. At that time, Laksminkara was only seven years old but she was already exhibiting all the signs of an extraordinary being. She was a beautiful and intelligent child who received teachings from the master Kambala and others. The years rolled by and when she turned 16, it was time for her to get married. She was sent in a royal procession to the Kingdom of Lankapuri. Up until that time, she had lived a sheltered life in the palace and she was terrified of what would happen to her as she started her new life. At this point, she only thought of engaging in her meditative practices. The departure of the royal procession was delayed and they arrived late at the palace gates of the strange new city. They were not allowed to proceed and were informed by astrologers that it was an inauspicious day to enter the palace. Thus, they had to spend the night outside the palace gates. The princess felt apprehensive about her new environment and as the night progressed, she fell into a depression. As she observed the hustle and bustle of ordinary people, she became even more depressed when it dawned on her that this strange new city was full of people who had never heard of the Buddha’s name. When dawn came, she was finally allowed to enter the palace. Just before entering, a hunting party rode past with a dead deer slung over one of the horses. The head of the party was a fine young man dressed in princely regalia soiled with the blood of that same deer. Shocked to find out that this prince would be the one she was to marry, she gave away her entire dowry, locked herself in her chambers and did not see anyone for 10 days. During that time, she decided that her only escape from this marriage was to pretend that she was insane. She tore her clothes, smeared oil on her body and raved like a mad woman. She did all this while secretly engaging in her sadhanas in her heart.When the prince came to see her, he was dismayed and ordered the court physicians to attend to her illness but to no avail. She continued to rave and create havoc until she found an opportunity to escape from the palace. She made her way to a charnel ground that became her home for the next seven years. During that time, the king’s latrine sweeper became her disciple and served her faithfully. When she gained realisations, she bestowed tantric initiation upon him. The sweeper practised diligently and he too gained realisations without anybody in the palace noticing. 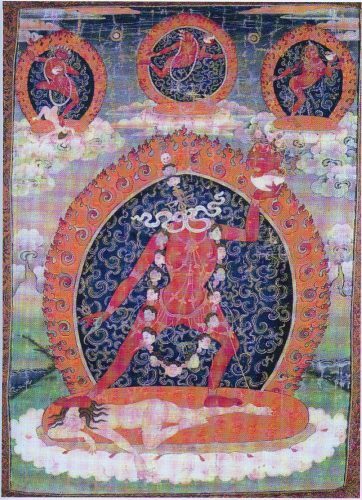 This old Tibetan thangka of the Headless Vajrayogini bears testament to the proliferation of her tantra in Tibet. One day, King Jalendra went out to hunt in the fields near the palace and somehow he got separated from his retinue. He wandered aimlessly in the forest in search of his companions. Suddenly, in the distance, he caught sight of Laksminkara seated on a jewelled throne, her body aglow with radiance. Faith arose in the king’s mind as he remained there transfixed all night watching the spectacle in her cave. The next day, his hunting companions finally found King Jalendra and they escorted him back to the city. The king however, could not stop thinking about the radiant yogini. Somehow, he found himself returning to the cave whenever he got the chance to escape his palace duties. One day, he summoned enough courage to enter the cave and prostrated himself before the yogini. In the beginning, the yogini Mahasiddha was doubtful of his true intentions but eventually, she was taken by the king’s persistence. He spoke movingly, declaring his belief in her as a Buddha. He begged earnestly for instructions. She pondered over his request and finally, she told him that he could not be her disciple as his guru should be one of his own sweepers. He was instructed to observe them closely to discover his real guru. The king returned to the palace and remembered the yogini’s instruction. He began to observe all his sweepers carefully and not long after, he discovered his true guru. He invited the sweeper to his throne room and placed him on the throne. Then he prostrated to him and requested instructions from the sweeper yogin. His sweeper guru was pleased with his humility and bestowed upon him the initiation by the transfer of the guru’s grace. Then, the yogin instructed the king in the generation and completion stages of the sadhana of Vajravarahi. The yogini Mahasiddha Laksminkara and her sweeper-yogin disciple performed innumerable miracles for many years before they both ascended into the Paradise of the Dakinis. The main surviving lineage of Ucheyma in Tibet is attributed to her. It appeared that she was initiated into the practice from a vision of Vajravarahi in the form of Ucheyma. There are many scholars with opposing views on the origins of Ucheyma or Chinnamasta. One of the more reputable ones is Benoytosh Bhattacharyya (1897 – 1964), an Indian scholar and specialist in the history, theory and practice of Buddhist tantra. He was interested in tracing the influence of Buddhist tantra on Hinduism. By examining the various sadhanas in traditional collections like the Sadhanamala, he introduced the theory that the practices of Tara, Chinnamasta and Manjughosa had their origin in Buddhism. With regards to Chinnamasta or Ucheyma, Bhattacharyya examined the meditations, mantras and iconography found in Hindu and Buddhist liturgies. He compared the Buddhist Sadhanamala (circa 1165 CE), the Hindu Chinnamastakalpa (uncertain origin) and Kshnananda Agamavigisa’s Tantrasara(17th century). When comparing the descriptions of the deity, he came to the conclusion that the deity in the Buddhist and Hindu texts are essentially the same, except for a few minor differences. He noted that the Hindu Chinnamasta wore a snake as a sacred cord around her neck and that she stood on a copulating couple named Rati and Kama. Furthermore, Bhattacharyya went on to compare the mantras of both traditions only to find Buddhist precedence. Within the Buddhist Sadhanamala, the name of Chinnamasta was Sarvabuddhadakini and the attendants were Vajravairocani and Vajravarnani. On the other hand, the Hindu Tantrasara referred to the deities with the same names but omitted the title “Buddha” and the prefix “Vajra” probably due to their strong association with Buddhist Tantra. Therefore, they became known as Dakini, Vairocani and Varnani. Furthermore, Sarvabuddha in the Buddhist text became Sarvasiddhi in the Hindu text. In the Hindu Chinnamastakalpa text, Sarvabuddha was written as Sarvabuddhi instead while maintaining the prefix “Vajra.” Therefore, he concluded that the mantra was derived from a Buddhist source. Essentially, Bhattacharyya examined the differences between the iconography, the dates of the various texts and the mantras of both traditions before concluding that Ucheyma or Chinnamasta was of Buddhist origin. Ucheyma, like many other tantric practices, is often performed in a charnel ground. A tantric yogi, instead of adorning the body with perfume and nice clothes, takes the ashes of the deceased and smears his entire body with them as a sign of renunciation of the senses. Then, he proceeds to the charnel ground and sits on top of a corpse to do his practice. He holds a damaru (hand drum) and a skullcup filled with sacred inner offering. In India and Tibet, charnel grounds are unlike their modern equivalents of the neatly manicured cemeteries that we have today. They are frightening places with dead bodies lying all over, chopped up and ready to be fed to the vultures. They are also places that are haunted by the spirits of the deceased, many of whom are very attached to their former bodies. This is combined with the energy of the charnel ground where countless family members, loved ones and friends of the deceased have come to mourn. This adds to the negative energy of the place. Headless Vajrayogini probably began as a practice amongst yogins and sadhus who meditated in the charnel ground. It is precisely for this reason that the charnel ground is the ideal place to practise according to the old tantric tradition. In this place, our ego is brought to the fore because we are in a state of fear. When our ego is exposed, it can be worked on and be eliminated through our practice. If we examine ourselves deeply, we will understand that we are frightened of such places because of our instinct for self-preservation. If we have real refuge or we hold our vows, we shouldn’t be afraid in the first place. Hence, tantric practices like Ucheyma are commonly practised under such conditions. The living tradition of meditating in the charnel ground is still being practised especially in Tibet. It is also practised in other Buddhist countries like Thailand where monks meditate on bones. The purpose of meditating in charnel grounds is to develop deep renunciation in order for one’s practice to be successful. In fact, some lamas do not need to physically be in the charnel ground because they can transport their minds there and live in total renunciation. 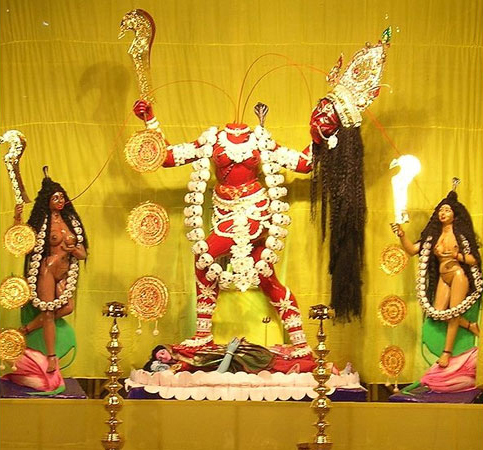 Ucheyma, otherwise known as Chinnamasta or the Severed Head Vajrayogini is not a major Vajrayogini lineage today unlike the Naro, Indra and Maitri Kechari traditions but she continues to capture the imagination of practitioners just as she did in ancient India. Hence, she is one of the few Buddhist deities that have been appropriated by the Hindu pantheon, where she is known as one of the ten Mahavidya goddesses. Nevertheless, most scholars agree that her worship originated from Buddhism. To this day, there are many temples in India dedicated to her as her worship in the Hindu tradition is still very much alive. The Buddhist practice of Ucheyma is also still very much alive and is popular with certain pockets of Tibetan followers. Thus, this practice which centres on the sacred act of cutting the ego as portrayed by Ucheyma continues to live on in both traditions. A sadhana is a daily set of prayers, mantras, offering verses, visualisations, meditations and verses of praise engaged in by practitioners to identify themselves with a Buddha deity (yidam). In this case, the Ucheyma sadhana is meant for practitioners to become one with her. That means the practitioner can attain her qualities of great bliss and emptiness via her meditative practice. Ultimately, all of us have the primordial clear light mind which is our Buddhanature within, that has long been buried by innumerable lifetimes of negative karma and obscurations. With practice however, we can uncover this Buddhanature through tantric practices such as that of Ucheyma. The practice begins with replacing our ordinary self-identity, whose nature is false and leads towards negative karma and suffering, with the radiant form of Ucheyma, whose qualities of great bliss and emptiness lead us to the sublime state of pure Buddhahood. Taranatha, who was a prolific author and eminent scholar. 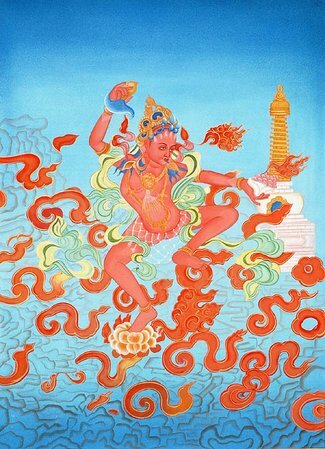 Ucheyma’s practice is included in his Rinjung Gyatsa, a compilation of 305 deities’ practices and images. The sadhana of Ucheyma can only be practised by those who have already been initiated into her practice through an initiation ritual, where the lama leads one into her mandala abode and implants the seed of Bodhicitta and the accomplishment of Ucheyma’s path within one’s mindstream. Without initiation, practising the sadhana will have no effect. Though Ucheyma’s practice is not widespread, there exists a few different versions of her sadhana (daily practice) which transforms a practitioner’s mind and leads them to enlightenment. The first text presented below is included in the Rinjung Gyatsa cycle of teachings. 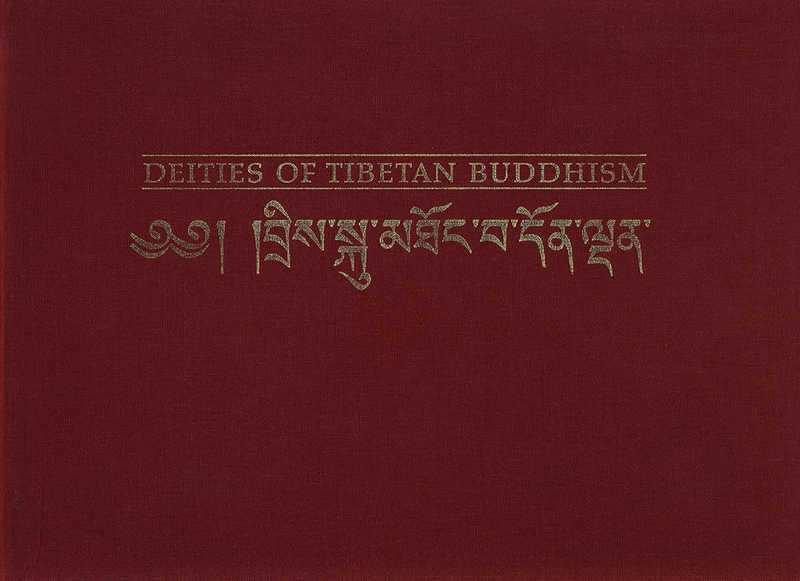 The Rinjung Gyatsa is a collection of sadhanas and initiations of 305 unique meditational deities spanning all four classes of Buddhist Tantra. 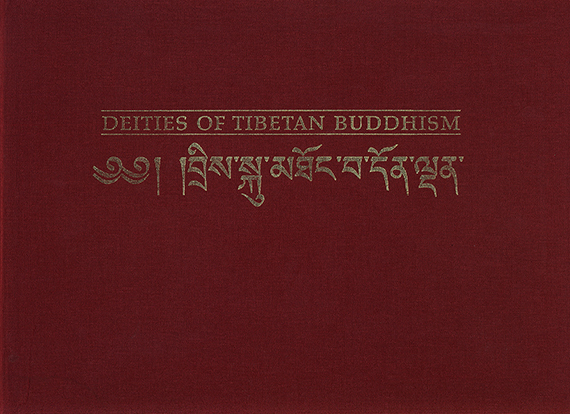 The text was compiled by Jetsun Taranatha of the Jonang tradition and includes practices from all major Tibetan traditions. Jetsun Taranatha was a prolific writer and eminent scholar, who authored the famed History of Buddhism in India, a survey of Buddhism’s development in the sub-continent as well as its transmission into Tibet. He also founded an important Jonang monastery in the Tsangpo Valley, which propagated his lineage. 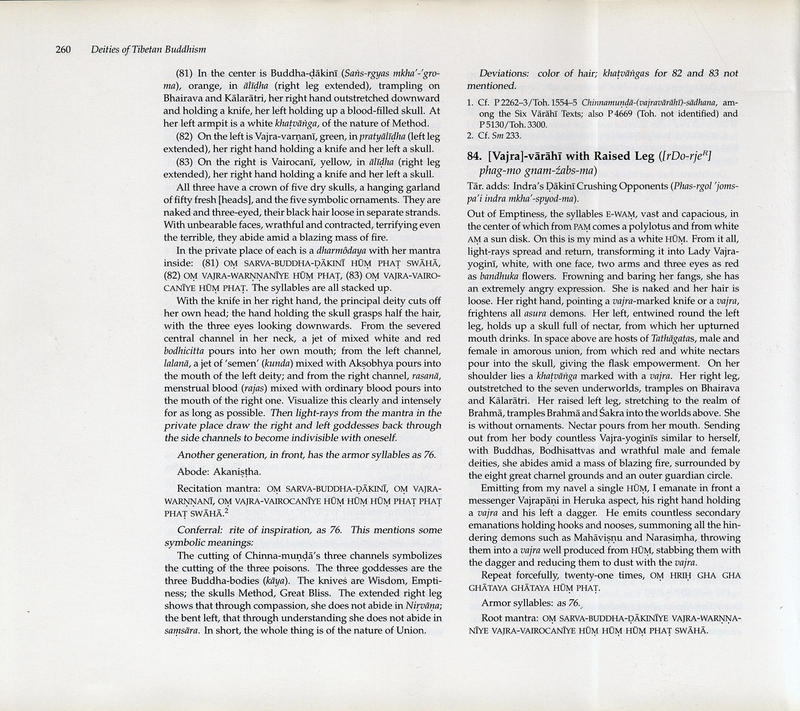 Having studied under a great many Tibetan masters and two Indian gurus, he sought to collect all the practices he had received into one collection. 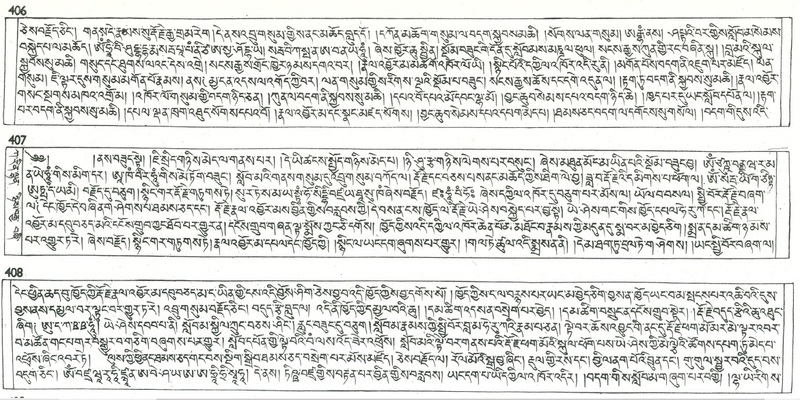 Thus, the Rinjung Gyatsa text was created. In the section dealing with the various forms of Vajravarahi, Ucheyma is included, thus providing evidence that her practice was an efficacious one that Taranatha thought worth preserving in his text for future generations. 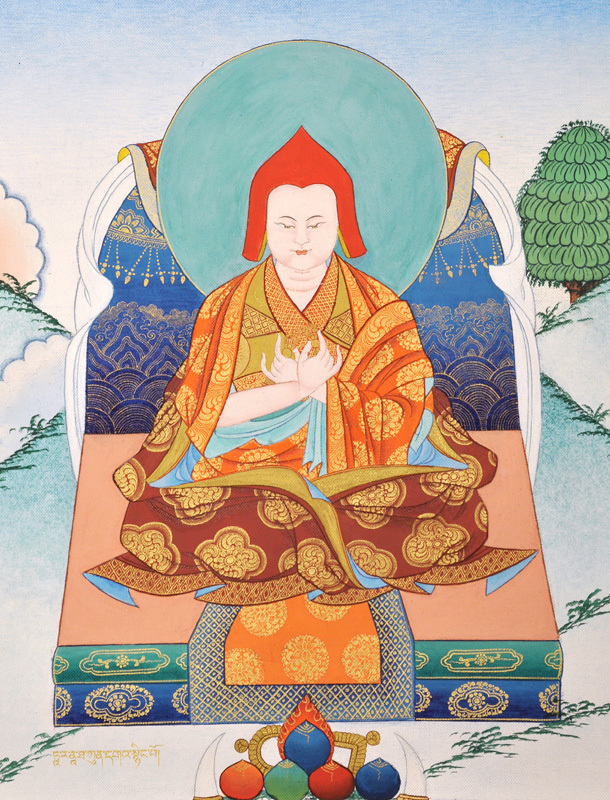 The 7th Panchen Lama Tenpai Nyima, a statesman and attained practitioner who included Ucheyma’s practice in his collection of sadhanas known as the Rinchen Lhantab. The second text is from His Holiness the 7th Panchen Lama Tenpai Nyima’s collection of practices known as the Rinchen Lhantab. It is also known as the 7th Panchen Lama’s Sadhana-Mala, which means “Rosary of Practices”. The many highly illustrious Panchen Lamas are known not only to be great statesmen, but spiritual masters of the highest calibre. Notably, the 7th Panchen Lama acted as Regent of Tibet, enthroning both His Holiness the 9th Dalai Lama Lungtok Gyatso (who died young at the age of nine) and His Holiness the 10th Dalai Lama Tsultrim Gyatso. 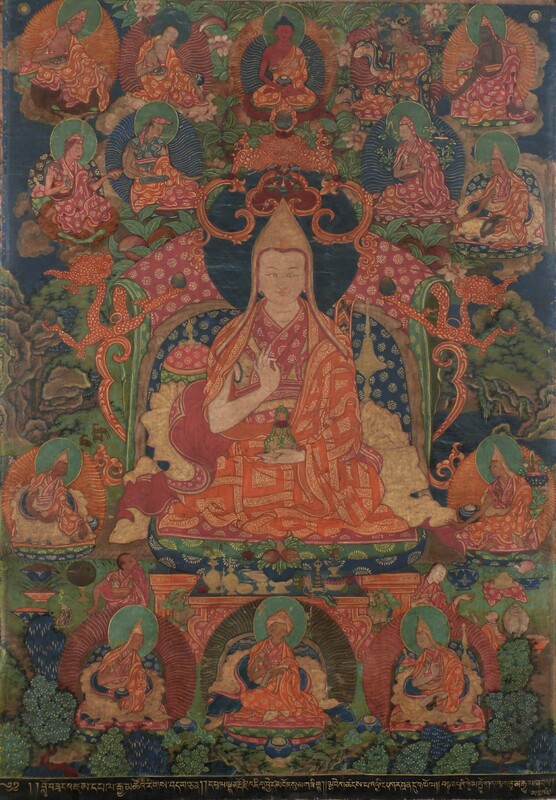 The holy Panchen Lama based his collection of sadhanas on another earlier work, also attributed to Jetsun Taranatha. Taranatha, in turn, had based his collections on an earlier Indian collection which derived from the two older collections known as the Sadhanasamuccaya and Sadhanasagara. Both of these collections have their origins in the Tantric section of the Tangyur, or the commentarial treatises of the Buddhas teachings. The prayers below are shared so you can appreciate the lineage, authenticity and potency of this practice. They should only be recited by those who have received the initiation of Vajrayogini. From the Rinjung Gyatsa (Deities of Tibetan Buddhism). Click to enlarge. From the Rinchen Lhantab. Click to enlarge. Thank you for writing of the kindness shared by Rinpoche. This is something I am profoundly happy to read of, as you also describes a common bond between us. As for myself, being so fortunate as to have received from Rinpoche, a precious statue of Gyenze Shugden not so long ago, I rejoice in the greatness of your good fortune, such has been mine, and for the auspiciousness of such a gift. It was my first true Buddha Statue as well in the gift of Gyenze, and knowing we received these representations of Buddha’s body, speech and mind from an authentic source of the teachings, it is a delightful thing to share indeed. Knowing Rinpoche has gifted others in the same way is a bond we all share, which will be cherished and never diminished in my minds continuum. Thank you for posting Pastor David. Well wishes of long life and continued successes to you. 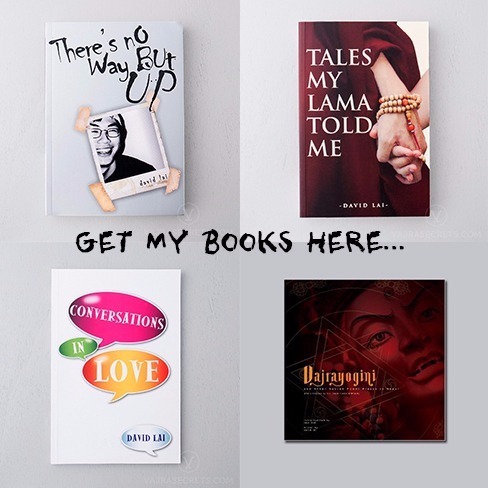 Hi Gender-Bending, Yes, you can PM me via my email at kmp.davidlai@gmail.com. We can talk about it in private. My apologies for not noticing your message earlier. Hi Pastor David, I was wondering if I can PM you. I have questions about who I am and if I should tell my parents what orientation I am into. I am afraid. Do you know anyone who can give me advice how to accept myself and tell my parents. What happens if they reject me? Audrey's Blog Girly and all things WTF! Huai Bin's Blog Huai Bin’s food and travel escapades. © 2019 There's No Way But Up. All Rights Reserved.